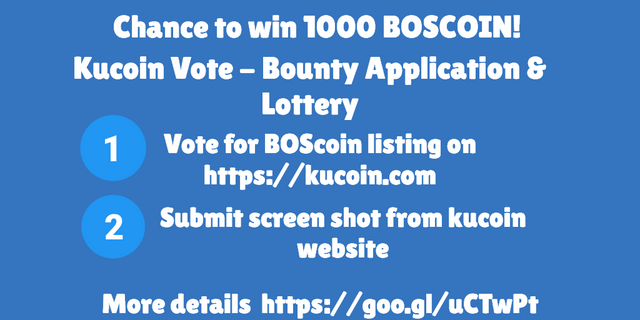 Go to https://kucoin.com and vote for BOScoin listing. It costs 0.1 KCS, but if you fill out this form you will receive 2 BOS in your BOScoin wallet, and the chance to win 1000 BOS. 10 participants will receive 1000 BOS no matter what! But if we win the vote (and get listed on Kucoin), then 20 community members will receive 1000 BOS! You can find the BOScoin wallet at https://wallet.boscoin.io to create a public address, ensure you save your Secret Seed! It can't be recovered! Also remember you can't open the wallet until you have at least 0.1 BOS deposited. One application per person/public address, all duplicate submissions will be discarded. Retweet if you can https://twitter.com/bosradar/status/936620817521131521 to spread the word and help boscoin listing. I voted for boscoin, but the rivalries are very strong. I hope they will not just add the first one. I think I need binance yi additions. The rival company, the other stock exchange did not even take you to vote. i think good yobit exchange.why in yobit to vote dev? In mid December other exchanges like hitbtc will also allow sending withdrawing boscoins. Its in IOU phase on hitbtc. Boscoin is leading now with 521 votes. voted, best wishes for you. why dont you consider other small exchanges in parallel as backup? like graviex or vicex or a better one crypto-bridge. though it seems they have increased listing fees but still that is good and cheaper than other in the market.